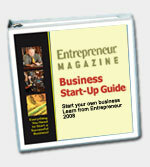 BusinessMart.com strongly recommends Entrepreneur Magazine's Cleaning Service Start-Up Guide. For more information read below. To purchase this book click on BUY NOW. Households are not the only places that require a thorough cleaning--so do offices, retail locations, and other businesses. And that's why few industries can claim the variety and depth of opportunities that professional cleaning can. This in-depth guide shows you how to start three hot cleaning businesses: residential maid service, commercial janitorial and carpet/upholstery cleaning. Most cleaning service businesses can be operated on either a part-time or full-time basis, either from home or from a commercial location, and the best part is, you can build an extremely profitable business that will generate revenue very quickly. If you want to start your own cleaning business, take your first steps with our startup guide.